Giuliani did not appear to understand the mistake and used it to add to growing claims that Twitter is biased against conservatives and Trump supporters. 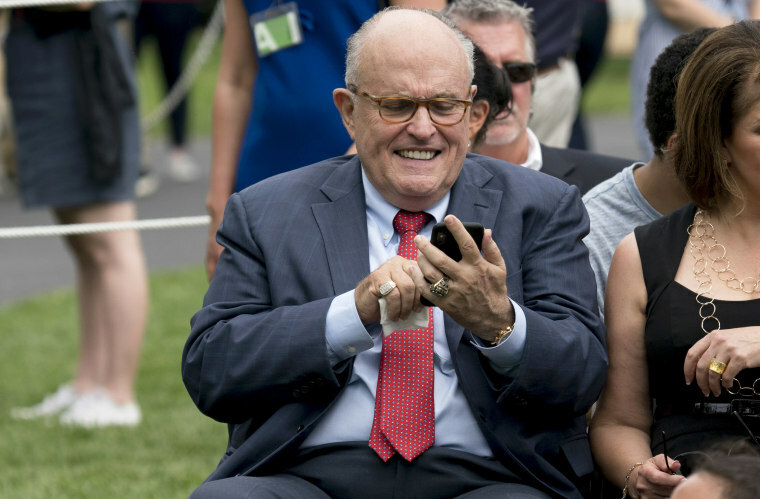 Rudy Giuliani, President Donald Trump's attorney, falsely alleged that Twitter was behind a conspiracy to "invade" his Twitter account on Tuesday night after he accidentally tweeted a link to a website that called the president "a traitor to our country." So Giuliani inadvertently posted a link to a website that didn't exist until he tweeted it out on Friday. He did not appear to understand the mistake and used it to add to growing claims that Twitter is biased against conservatives and Trump supporters. "Twitter allowed someone to invade my text with a disgusting anti-President message. The same thing-period no space-occurred later and it didn’t happen. Don’t tell me they are not committed cardcarrying anti-Trumpers. Time Magazine also may fit that description. FAIRNESS PLEASE," Giuliani tweeted just before 8 p.m. on Tuesday. Placing any text before ".in," the equivalent of ".com" in India, will result in a web address that will then redirect Twitter users to a website. Jason Velazquez, who runs a small online design business in Atlanta called Pixel Riot, noticed that “G-20.in” was still available shortly after Giuliani tweeted it on Friday and saw an opportunity to "do something funny." "I thought, ‘I could just buy this and put whatever I want on it,’" Velazquez told NBC News. He said he "put up the site really quick" then left for the night to go to a Friday night improv class. "By the time I came back, it went viral," Velazquez said. Twitter also denied it is possible to "invade” a user's text message, and timestamps show that Giuliani's link was live before Velazquez bought the domain name, according to domain registration records. Velazquez, whose firm does not have an office, said that he doesn't know anyone at Twitter, and that there was no conspiracy between him and the company. Giuliani's punctuation is sometimes spotty on Twitter, which he also pointed to as possible evidence of a conspiracy. In the same tweet, he typed "Helsinki.Either," with no space after the period. A top-level domain for ".either" does not exist, so Twitter would not recognize “Helsinki.Either” as a hyperlink. has marketed himself as a "security expert" in recent years, including in a commercial for a "dark web scanning" product for the consumer credit report agency Experian. He also gave a speech about cybersecurity at the Blackberry Security Summit in 2016. The day after posting his tweet that accidentally contained the G-20.in URL, Giuliani replied to his own tweet with what appears to be a string of random characters. "Kimim ° has f," Giuliani tweeted. Velazquez has been updating G-20.in with links to news reports about the Russia investigation since buying the domain.